Azalea Hostel i Santa Marta, Colombia: Reservér nu! Con el fin de garantizar la reserva, será necesario el pago del 100% del valor de la Primera noche de estadía por parte del huésped o entidad interesada. La cancelación de cualquier reserva deberá hacerse vía correo electrónico antes de 8 días en temporada baja y 15 días en temporada alta con respecto a la hora de Check-In ( 1:00 PM) del día de llegada. En el caso de reservas canceladas sin la suficiente anterioridad o en caso de No-Show, no se efectuará el reembolso, si tiene datos de tarjeta como soporte se realizará el cobro. The most important thing we can say about azalea is that it is more our home than a hostel. The members of our family, work and live here. We really enjoy what we do and hope to be able to meet and always help new people. Azalea Hostel has many facilities, such a bathrooms for each bedroom a central area with hammocks , bar for guests and a communal TV room and communal kitchen plus a superb night lighting and very calm environment for those who simply want to rest from their long journey and the most remarkable thing is how easy is to get to tayrona park or minca or any of the touristic places in the santa marta city becose is possible to reserv the transport to minca not overcost directly from the hostel and the car will arrive to pick yours up, or to tayrona the bus pass just in the corner. 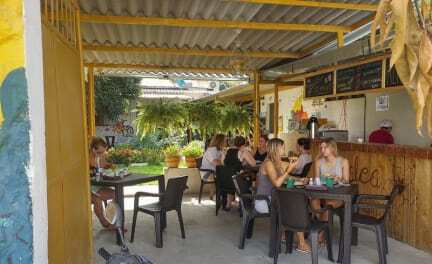 Azalea Hostel is located less than 10 minutes by bus from the Quinta de San Pedro alenjandrino 10 minutes from Santa Marta Bay and transportation to the Tayrona park passes close to our special facilities as well as most public transport routes to and from most tourist sites in the city. We have four mixed dormitories with a capacity of up to six people maximum per bedroom of which three are air conditioned and one is only fans, each bedroom has a full bathroom for exclusive bedroom and access to our common areas of television, kitchen , section bar and hammocks.